Washington is processing to sell 8 fighter-planes F-16 to Pak on being approved by American Congress to the deal; however it is a big concern among many members of American lawmakers lest these high-tech fighter-planes, instead anti-terrorist operations, may be used against India. According to a published report in NYT, a few days earlier of meeting between President, Barack Obama, and the prime minister of Pakistan, Nawaz Sharif, at Oval office the American congress was notified about the proposal of selling F-16planes. Many members of congress perceive a little fear of fighter planes which may be used frequently, besides anti-terrorist operation, against India during the battle. Nawaz Sharif on Tuesday has reached America on an official visit and he is to meet with Obama according to the schedule. 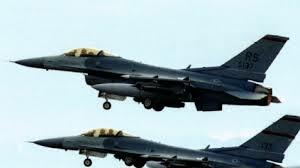 If these fighter planes F-16 are brought in Pak, it will strengthen the air force of Pakistan. The Pakistan has already stockpiled more than 70 fighter plane F-16; and the dozens of French and Chinese made planes are available. According to the report, whether American Congress will approve this proposal of purchase deal or not is not clarified. The American foreign department had approved the purchase deal of military equipments worth 1 million dollar on Pak indent before this.